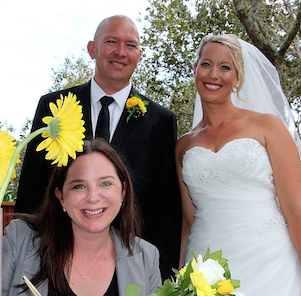 I am a local wedding celebrant and MC, who is known for creating a relaxed, yet professional, atmosphere at weddings. 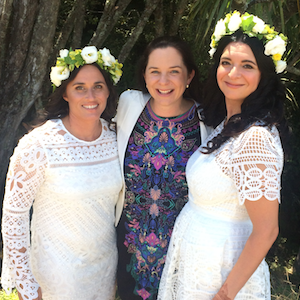 As your celebrant, I will get to know you through Skype, email, phone and/or face-to-face catch ups so I can create and deliver a 100% personalised ceremony for you. I take such pride in getting to know my couples, that it is quite common for guests to think I am a friend of the couple. If you are having a wedding reception and you are stuck for an MC, great news – I happy to stay on and host your reception for you as well. I am qualified with a Communications Degree, majoring in Journalism and I worked in radio for nearly 15 years before becoming a celebrant…So, as you can imagine writing and public speaking are two things I am very passionate about. While working in radio I was the National Marketing Manager for ZM, Radio Hauraki, Flava, Mix, Classic Hits (now The Hits), Newstalk ZB, Coast and Radio Sport. 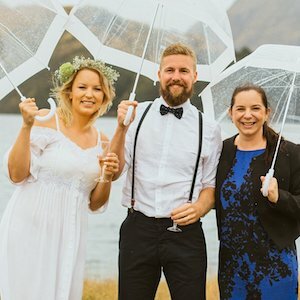 I have also been the General Manager for Keep New Zealand Beautiful, an international tour guide in Europe, plus an MC for loads of events including fishing tournaments, concerts, weddings and all sorts of other celebrations. I live in Wanaka with my husband, Neil and our beautiful ragdoll cat, Neela. 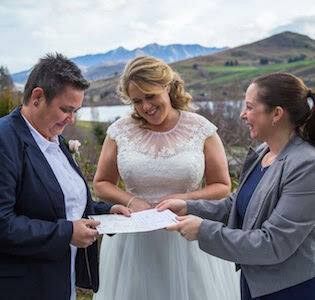 When I am not busy being a celebrant, you can find me running the Queenstown Wedding Association, out taking photos or enjoying the outdoors.